Do I need to be a Red Bag Rewards member to receive sale prices? No. Our program is no hassle and has no hidden pricing. The same great items are available at the same great prices for all of our guests. What if I don’t want to carry a card? No problem. Simply input the cell phone number associated with your account each time you check out. When you reach 500 points, you may redeem your points for free items. You may also accumulate your points beyond 500 and redeem them later for free items at a higher tier, or multiple items at a lower tier. Where can I see a list of the free items I can earn? 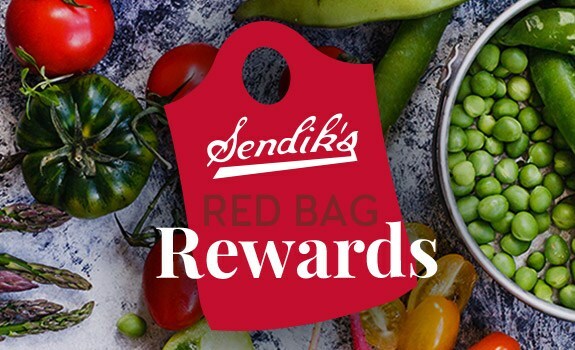 Please look for signs in your neighborhood Sendik’s or you can view the rewards on our website at any time. Your points will expire only if you have not shopped with Sendik’s in six months at Sendik’s Food Markets, Sendik’s Fresh2GO or sendiks.com. What if I don’t have a mobile phone or an email? You can earn Red Bag Rewards points without a cell phone or email. You can get a card at any Sendik’s Food Market or Sendik’s Fresh2GO location. However, if you lose the card, we will not be able to track any of the points that were on that card. You will need to re-open a new card. We recommend that you use your cell phone to open a Red Bag Rewards account so we can track your points in case the card is lost. What types of purchases will earn points? You will earn 1 point for every $1 you spend. This excludes fuel, tobacco, lottery, stamps, bottle deposits, fundraising and gift cards. I didn’t provide my mobile number or Red Bag Rewards card, but I have the receipt. Can I still get points? We are unable to give you points for a past transaction where a cell phone number or Red Bag Rewards card was not presented. Your cell phone number or Red Bag Rewards card must be provided and scanned at the time of purchase to receive points. Please have your cell phone number or card ready when checking out. Didn’t find the answer you were looking for? Contact us at rewards@sendiks.com.